Ruger recently introduced the bolt-action Precision Rimfire, a Mini-Me version of its popular centerfire Precision Rifle. It features many of the traits that made its big brother a hit but in a compact, flyweight form. Weighing 6.8 pounds and with an overall length of 35 inches with the stock retracted, the Precision Rimfire is 3.8 pounds lighter and eight inches shorter than the Precision Rifle. This fun-sized rifle is chambered in .22 LR, making a trip to the range a relatively cheap adventure. Considering its many features, the rifle is wallet friendly at a suggested retail of $529. The bolt throw can be changed from rimfire length to short-action centerfire length—a great training aid if you shoot centerfire competition—by means of a C-clip. The Precision Rimfire chassis is one-piece molded glass-filled nylon and is tunable at every critical point. The adjustable stock has length of pull from 12 to 15.5 inches, the comb height can be raised one inch, and the fore and aft position of the comb has four inches of adjustment. A single quick-release lever allows the fit of the buttstock and comb to be customized. 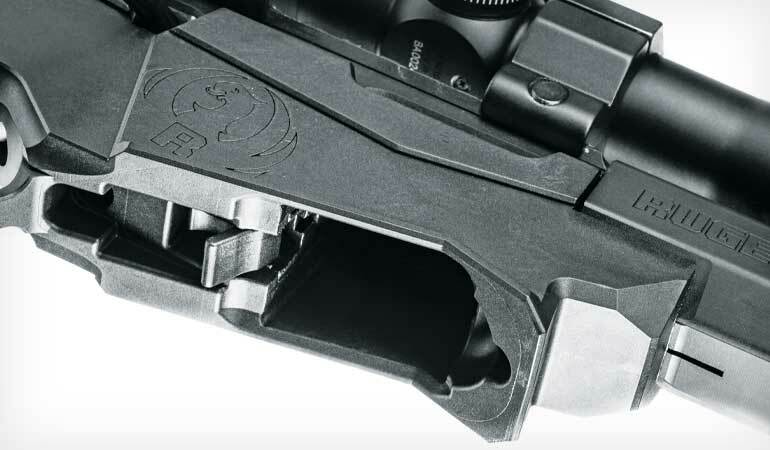 The plain polymer AR-style grip, which shares the angle of the centerfire precision rifle, is replaceable, and the AR-style safety selector is swappable to the right side of the action. The trigger is the familiar bladed Ruger Marksman adjustable trigger, which is adjustable from 2.25 to five pounds. It arrived from the factory set to three pounds, 8.5 ounces. 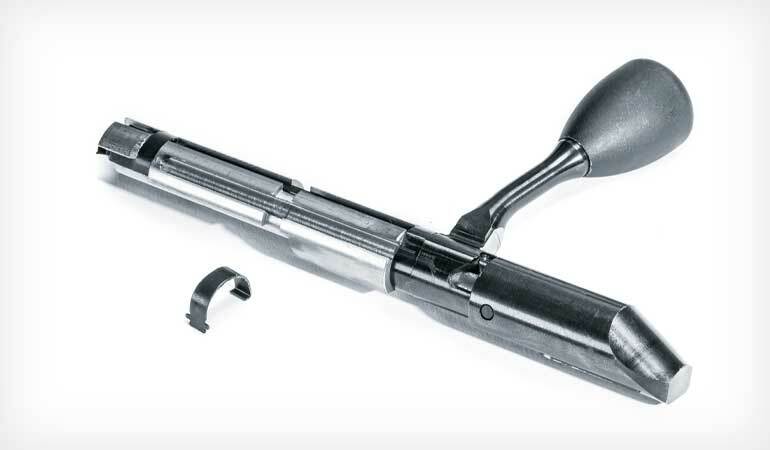 I prefer a lighter trigger press, so I opened the manual to read the adjustment instructions and discovered that Ruger wisely included an Allen key in a hidden compartment at the front of the buttstock. The trigger adjustment bolt is accessible without disassembling the rifle. A couple of twists of the Allen key set the trigger weight down to two pounds, nine ounces. The bolt likewise shows a thoughtful design. It has an oversized handle that’s the same size as the centerfire Precision rifle, and the throw of the bolt can be changed from a 1.5-inch throw to a three-inch throw by removing a C-clip. These features give the Precision Rimfire the mechanical operation of Short-action rifle, which is especially great if you’re using the rimfire as a trainer for your centerfire precision gun. The magazine well on the Precision takes, naturally, 10/22 magazines. And these days you’re not restricted to 10-rounders; a 15-rounder ships with the rifle where legal. Other features include a 30-m.o.a. scope rail and a 15-inch aluminum free-float Magpul M-Lok handguard. The handguard has plenty of available space to mount multiple rails for attaching bipod mounts and barricade stops. 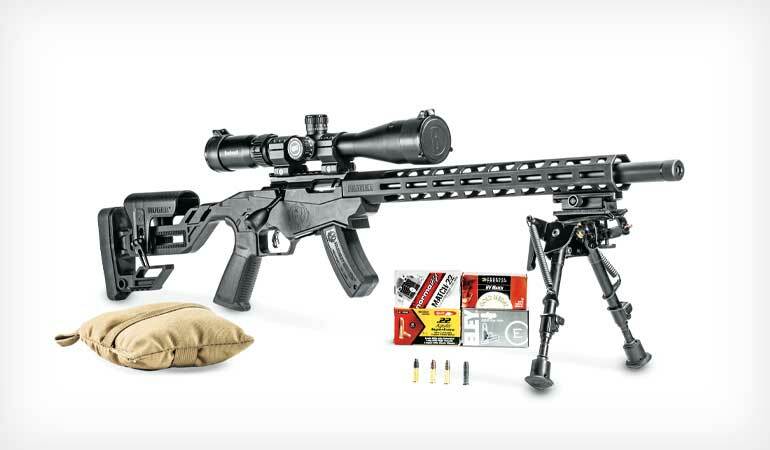 Anticipating that this rimfire rifle will enjoy the popularity—and aftermarket products—of its other rifles, Ruger designed it with a gunsmith-friendly replaceable barrel. A barrel swap requires an AR-style wrench and headspace gauge. The factory bull barrel is cold-hammer-forged from 1137 alloy steel, has a 1:16 twist and is threaded 1/2x28 for standard muzzle devices and suppressors. The Precision Rimfire is available in two models: one with a 15-round magazine and the other with two 10-round magazines. It accepts 10/22 magazines, which can be found at most gunshops, and has an AK-style push-lever magazine release. I found that both 10- and 15-round magazines seated with a positive click and released with ease. I initially shot the Precision Rimfire at a writer’s event at Gunsite Academy in Arizona, where I spent a day getting a great feel for its performance in several informal shooting competitions with targets set at varying distances out to 200 yards. I ran the rifle hard and shot a minimum of 250 rounds. There was only one hiccup, and that was due to short stroking the bolt in haste. After the event, I was so impressed with the rimfire rifle that I ordered one. I subsequently shot another 250 rounds with a new rifle, which included the accuracy and velocity testing, and it continued to be fun and effortless to shoot. All of the ammunition I tested ran flawlessly. The Precision Rimfire features a lot of “big boy” features, including a tactical-style bolt, swappable AR safety and a 30-m.o.a. Picatinny rail. Accuracy results are shown in the accompanying chart. As you can see, Eley Edge had the smallest average group, and it also produced the best single group at 0.37 inch. The cheapest ammo, Aguila Super Extra, provided the second-best average group; this doesn’t surprise me because Aguila .22 LR has always performed well for me in handguns and rifles. I also shot one five-shot group with each brand at 100 yards, and surprisingly, the Federal Premium Gold Medal HV, which had the largest average group size at 50 yards of 1.13 inches, had the best group at 1.41 inches at 100 yards. By comparison, the 100-yard groups for the other ammunition doubled in size. The Ruger Precision Rimfire is a great rifle unto itself. With little felt recoil, a crisp trigger, excellent accuracy and reliable operation, it can be fun for the whole family. 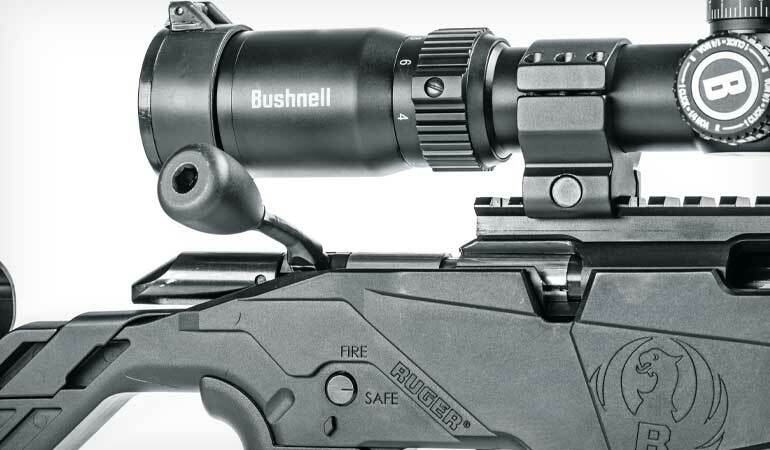 But what makes this a must-have rifle are the traits it shares with centerfire precision rifles. Its customization, adjustability and operation make it an excellent training rifle for precision shooting. The rifle can help with shooting fundamentals, positional shooting and target transitions without the steep costs of a centerfire rifle firing match ammo.